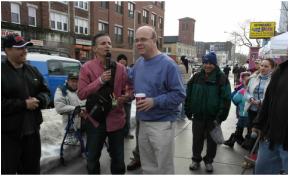 Every Saturday since 2010, Net of Compassion has served over 300 hot meals right on the street in the Main South section of Worcester. In addition to a hot meal we give clothing, food pantry groceries and encouragement. We serve men and women struggling with poverty, active addiction, prostitution, homelessness and those living with mental illness. ​Together we are putting all the threads together to make a strong Net of Compassion! If you ask Miguel Morales why he comes every Saturday to the lunch served by Net of Compassion, you might be surprised by his answer. "He gives out food and clothes, but when people come, what they want most is a hug and a few words with him," Mr. Morales said. Read the entire Telegram article by clicking here. 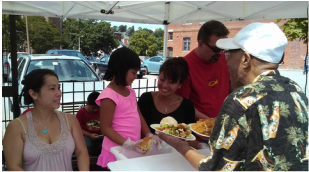 ​Each week volunteers cook and serve a homemade meal to over 300 folks living in poverty in Worcester, Massachusetts. These Net of Compassion volunteers also help by organizing and handing out clothing. Many people visiting the Net of Compassion tents are currently struggling with homelessness, active addiction, in early recovery or suffering from untreated mental health concerns. 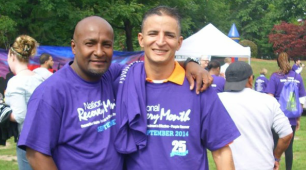 As a peer run organization, many staff have had long term experience with the recovery process. This insight helps to establish great working relationships with clients, which in turn leads to a better understanding of the help they really need. Services include access to shelters and detoxification programs. Through faith based peer counseling and agency referrals, Net of Compassion helps clients to find hope again. ﻿Net of Compassion relies 100% on private donations and small grants.